ACC Health remains committed to providing outstanding patient care by adopting the voluntary CQIIP validation protocol for immunizations as recommended by Mr. Chin Wang, Immunization Healthcare Specialist with the Defense Health Agency, Immunization Healthcare Branch (formerly MILVAX). ACC Health continues to lead the industry in applying medical best practices by partnering with the Department of Defense to ensure our troops receive consistent, high-quality care. CQIIP, Continuous Quality Immunization Improvement Process, was created by the Department of Defense, Education Department of the Military Vaccine Agency. CQIIP assist facilities in assessing their compliance with the immunization standards and are administered in accordance with DOD policies and the CDC's General Recommendations on Immunizations. ACC chose to adopt the program as one of the many procedures in place to protect patients, improve efficiency, and increase the speed and accessibility to medical records. ACC felt it was mandatory to implement this validation program as part of its SOP’s due to the potential impact on national security. The CQIIP evaluation provides ACC Health with a quality control tool to self-assess their immunization processes and ensure compliance with the 8 Standards for Military Immunization. The tool helps to identify areas of improvement and provides the healthcare personnel with a detailed evaluation of their immunization administration processes. From storage, handling and immunization availability, to record keeping and vaccine advocacy protecting the military family, CQIIP will help keep our military healthy and informed. “We don’t believe in cutting corners, and if there is a program available that will help us improve our business and medical practices, we are going to look into it. This should be a requirement for all companies who administer immunizations. Our nurses are DHAIHB trained and we have a QA process in place to assure we are meeting the high quality standards set by DOD” said Ginny Berger, CEO of ACC. Ginny Berger likens what her firm does to a rock band on a concert tour, complete with RVs, loads of specialized equipment and key staffers making sure it all goes off smoothly and on schedule. ACC Health LLC has offered occupational health screenings to clients since 2013, providing exceptional on location services to companies in New Mexico, Illinois, and Georgia. Be it private businesses, public companies, or government agencies, occupational health screenings are imperative for maintaining a safe work environment and preventing worksite injuries. During these exams, both the employee's safety standards and the industry's requirements are met. In April alone, ACC provided annual occupational health screenings for over 300 employees from all different occupations. Thousands of violations are reported each year, costing companies millions of dollars. Annual screenings through a reliable and credible provider can minimize costs. With proper evaluations, businesses can be assured they are compliant with required industry standards, and employees can safely handle the workloads necessary to perform their jobs. Due to increasing demand for ACC to provide these services, ACC has increased their team of highly qualified and specialized health professionals to manage the growth that is anticipated in the occupational health division. Over the next few months, ACC will be expanding this service, as well as their medical and dental health offerings, to all 50 states. "ACC understands the importance of providing top quality services that will protect those who face hazards in their line of work," said Ginny Berger, CEO. "Health and safety in the workplace is not something we can overlook, it is a crucial part of any organization." ACC offers employers the most convenient solution to meet their company's needs by performing all of their occupational health, medical and dental exams at the employee's work site. Time away from from their job is minimized, and access to care is maximized. Unlike other organizations, ACC provides 100% mobile on location services, with their own employees, not subcontractors that aren't trained and held to the ACC standard of care. "ACC Health performs my state's occupational health medical surveillance exams. The exams were convenient and efficient, completed in an expert and professional manner, in a comfortable environment. The ACC staff was extremely cohesive, knowledgeable, and flexible. Thank you ACC!," said LTC Monica Martinez-Archibeque, Occupational Health Manager for the Office of the State Surgeon NMARNG. ACC Health LLC was enrolled in the Legion de Lafayette in recognition of their extraordinary service to the National Guard Educational Foundation on Saturday March 8, 2014. Established in 1975 as a non-profit organization, it is the goal and mission of the NGEF to tell the story of the National Guard. Each year the NGEF honors individuals, corporations, and National Guard organizations for exemplary services and contributions to the foundation. ACC Health was presented with a medal similar to the regimental medal commissioned by the Seventh Regiment for presentation to the Marquis de Lafayette in 1832. Currently there are over 300 corporations, National Guard units, and individuals, including former president Ronald Reagan, inducted into the Legion de Lafayette. “ACC Health is privileged to support NGEF and give back to the organization that has meant so much to our company,” said Ginny Berger, CEO. “Our country must understand the incredible wealth of history that National Guard represents and we must assure present-time heroes are acknowledged. ACC Health is honored to be a partner to this great organization.” The Legion de Lafayette, created in 1988 to recognize and honor patrons that significantly advanced the Foundation’s work, commemorates the long-standing and historic relationship between the distinguished French soldier and the American Minutemen he served with during the Revolutionary War. “We are thrilled and humbled to receive such a generous donation from ACC Health that will go a long way in our efforts to preserve and share the rich story of the National Guard," said Maj. Gen. Steve Danner, the NGAUS and NGEF chairman of the board. 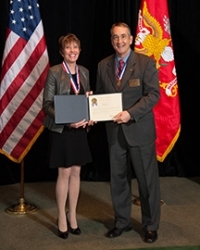 Photo: Ginny Berger, CEO and MG Steve Danner, Chairman of NGAUS. ACC Health Named One of New Mexico’s Top Workplaces for Medium Size Companies in 2013! The Albuquerque Journal has recognized 40 Companies and Organizations in New Mexico as Top Workplaces 2013. These companies have been recognized as Top Workplaces based solely on surveys about the workplace completed by their employees. Our Dental Director, Dr. Ashlee Bower, has earned her certification in the field of correctional healthcare-CCHP (certified correctional healthcare professional). Established in 1989 by the National Commission on Correctional Health Care, the CCHP certification program was the first to recognize professionalism and excellence among individuals employed in correctional health care. The credential is awarded to professionals who have met the program's eligibility requirements and who pass a national examination. The program is governed by the CCHP Board of Trustees, which is composed of ten correctional health care experts from a variety of health professions. CEO Nominated for Women on the Move Award! Our CEO-Ginny Berger was nominated for the 2012 Women on the Move award! This prestigious event was created by the YWCA in 1985 as an opportunity to celebrate extraordinary women who are making significant contributions to their community. The Women on the Move award recipients have distinguished themselves not only through their chosen fields but also through their community leadership. Congratulations Ginny! ACC Health Makes the News! Georgia Readiness Numbers Continue to Rise! As of Sunday, December 18, 2011, Georgia's MRC percentage reached. 87.73%. On this date, that was #1 in the country! We are Georgia's sole provider for both dental and medical services and are very proud of this statistic. We look forward to continually growing our partnership with the GAARNG and to maintain this current statistic. To get more information about our commitment to providing the best care anywhere, visit our website or call Todd Bower at 505-323-1300 ext. 682. ACC Donates To Help Special Olympics New Mexico! The ACC Health family has donated over $3200 to help the Special Olympics of New Mexico's annual Posole Ole fundraiser. This is such an important cause and one that ACC has supported for over 20 years. Way to go team ACC! ACC Health's event coordination team attended the MILVAX training course that was given last week in San Diego. The team came back to the corporate office with a comprehensive understanding of DOD vaccination programs, electronic tracking systems, adverse events and risk communication as it applies to these programs. As the only private contractor there, this training will be essential in providing our service members with the best care anywhere! ACC performed medical and dental services across 7 sites in the state of Georgia on the weekend of May 14-15, 2011. 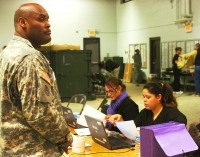 ACC cared for over 1,170 service members while achieving a 98% average category 3 conversion rate. We plan to keep up the pace and maintain our great conversion rates through the summer with services in 4 different states in August alone! 1199 service members were seen over the first weekend in June at 7 sites. 1141 service members walked out the door as a Cat 1 or 2. That is a “raw” conversion rate of 95%! If you take out the soldiers that were not willing or able to be converted due to circumstances beyond our control (pregnancy, biopsies, refusals, etc), the percentage rises to 97%. Great job ACC Health! The first two weekends of December have been successful as always for ACC and our soldiers. We saw 292 soldiers, at three different sites with a 100% conversion! Dr. Alan Duhon and Marilyn Maestas have been taking care of the oral health needs of geriatric patients at Total Community Care for five years.